Kelly shares on how she managed returning to work! This is a new series focused on personal journey with eczema while managing a certain aspect of life. Today, we have Kelly who will be sharing on returning to work, at about the time when her son with eczema was six-month old. 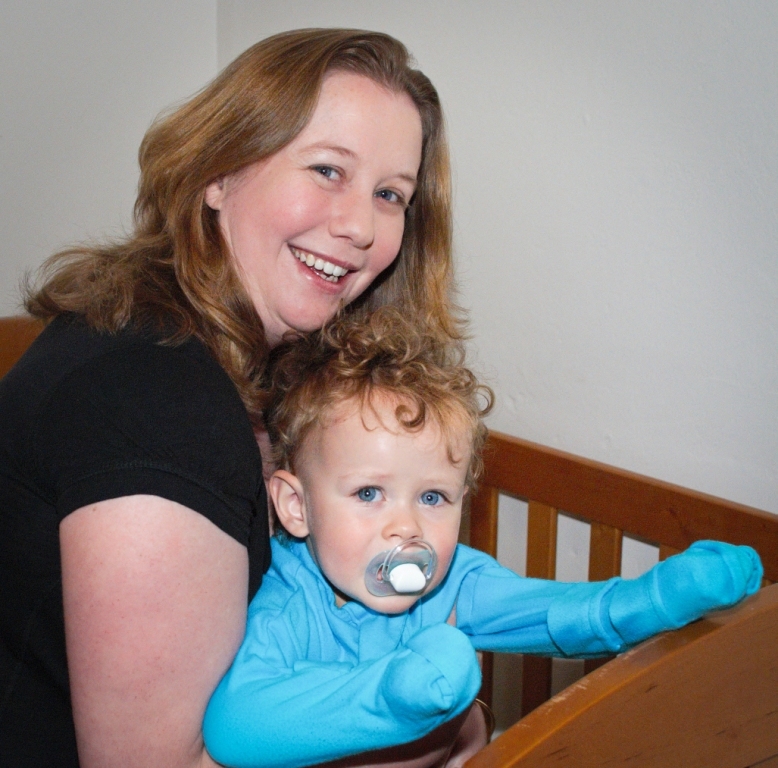 Kelly is the founder of Bamboo Bubby, and is a return guest of my blog, see here for her interview on the bamboo bubby sleeping bags. Marcie Mom: Hi Kelly, thanks for taking part in my new blog series ‘Someone has Eczema’! Let’s start with you sharing a little of your son’s eczema, when did he started to have eczema and how was it at 6-month old and now? Kelly: Thanks for the opportunity to share my experiences Mei! My son was around 6 months old when we finally found a doctor who put the word eczema to his dry, red and irritated skin and who referred us to a specialist eczema clinic. It wasn’t however something that just started overnight. I remember starting to search pharmacy shelves when he was two weeks old looking for a cream that would take away some of the dryness and irritation. We had also need numerous doctors over this time too who were quite blasé about it and would tell us to just use sorbolene (which made it worse!). I think we tried every other cream known to man in that time too as well as trying every type of formula in the hope of finding one that he would drink, because we thought he was just a ‘difficult drinker’ who fought every single feed, often pushing his bottles out of our hands so hard they’d fly across the room! It wasn’t until our eczema clinic appointment and after a round of allergy tests showed up an intolerance to cow milk protein, that the link between his milk refusal and his eczema became clear for us. We then went through a process of trying soy formula (this was the worst his skin had ever been), then a couple of prescription ones (which he outright refused) before we tried a goats milk one as a last resort and the change was instant from the first bottle. For the first time in his short little life, he drank a whole bottle instead of us forcing 10mls at a time into him. So we just kept giving him this and after a month or so his skin improved A LOT! We were of course also layering moisturizers on him after every nappy change as the eczema was all over his body, but especially bad on his cheeks, stomach, back and legs. Now, at 3 years old, he still gets eczema flareups, but we know what to do to control and manage it now. Flareups are now usually caused by sickness, fatigue or seasonal allergies. Marcie Mom: What were your son’s triggers and were they easy for you to communicate to your caregiver? Kelly: I think we were very lucky that we discovered his trigger not long after I returned to work and he started at our local childcare centre. They were fantastic about accommodating to his needs and being in the baby room, we took all his milk bottles each day anyway. Our Child Care Centre though is required to have policies and procedures in place to meet local and other legislative requirements, meaning they have a Healthy Eating Policy plus several around medication management. So, once we had a written management plan from the doctor that stated his trigger and that he needed moisturizers applied in a certain way after every nappy change it was a very easy process to communicate his needs. They have a very organized system of keeping track of all the babies various different needs and they did a really wonderful job of ensuring he was looked after in this regard. Marcie Mom: What was the eczema skin care routine you were using, and was it difficult to get the caregiver to understand and be committed to the same routine? Kelly: Of course there is probably no one else in the world who would do for your child exactly the same as you would yourself, because that’s what we do as parents for our children, often going above and beyond to feel we’ve done everything and the best possible job! However for us, obtaining the GP Management Plan really was the key to ensure the centre provided as close to what we were doing as possible with the regular application of various moisturizers and to make sure his trigger food was avoided. The aspect I found the most difficult to deal with though, was the sleep routine (or lack of) that our baby desperately needed, yet due to the eczema and milk intolerance we’d never had a chance to establish at home before then throwing child care into the mix! It was around this time that I made my first sleeping bag for him, which helped the caregivers to know that he wouldn’t be damaging his skin while sleeping. Marcie Mom: One final question – every mom needs to let go, at some point, of our newborn and especially difficult if the child requires special care. Was there a moment that tugged, pulled or pierced your heart when returning to work? Kelly: I think there was more than a single moment! For me the hardest part was actually knowing in my heart that returning to work was not the best thing for our family, but that it was unfortunately a financial necessity. I honestly never contemplated just how difficult it is to manage a condition like eczema on top of my own post-natally triggered condition AND return to work with the stress that this brings too, however I believe that having to ‘do it all’ has strengthened who we are as people and what we now know we can cope with. When I look back over the past three years, I’m now grateful for it all. I’ve learnt a lot about juggling of work, baby, household and about the importance of focusing only on doing what is important and necessary – everything else can wait and does get there eventually – it just takes longer than it used to. Marcie Mom: Thanks Kelly for sharing your journey on returning to work, we all go through it at different degree and different stages in our life, HUGS! As a parent it’s difficult for you to see your baby uncomfortable. You have a baby who is suffering from eczema so you must be aware of the condition that broadly affects everybody who are in contact with your child. Your child may be cared for or in contact with friends, grandparents, siblings, aunts, uncles, school carers. They need to know how eczema affects your child and how you can manage eczema. Understanding eczema is not only essential for your peace of mind but also for your child’s health. Parenting an eczema child is a challenging task, but not impossible. You need a strong support system to stay calm, energetic and full of life to help your child get rid of eczema and support him.